This blog gives an introduction about various proxy design pattern implementation variant in Java and ABAP. I will first introduce various proxy implementation approaches in Java and then research whether these approaches could be simulated in ABAP as well. Now the trouble is, Jerry’s project lead is not satisfied with the fact that the developers in the team like Jerry write code without any documentation. After discussion the whole team come to an agreement that the corresponding documentation must always be available together with the code. 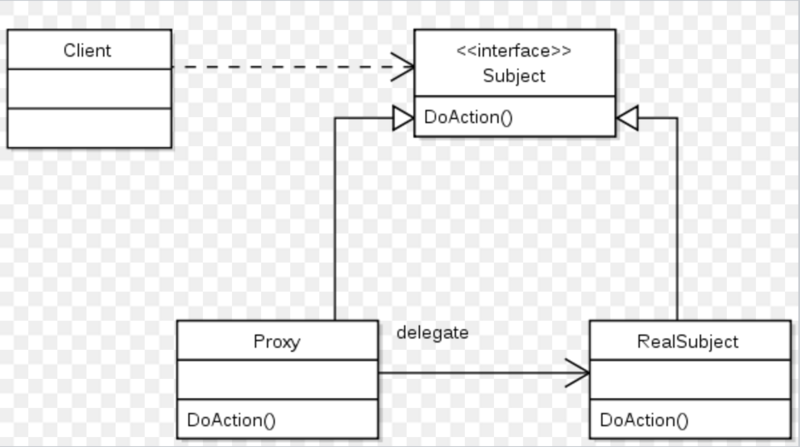 Suppose you would like to enhance the existing STABLE implementation against an interface without modification on itself, you can create a new proxy which implements the same interface and wrap the original implementation as a private attribute within the proxy. The enhancement is done in proxy implementation which is completely transparent to the consumer code. Back to the Developer example above, the consumer code does not care whether the variable it uses to call writeCode method points to a real developer or a developer proxy at all. 2. the relationship between original implementation and its proxy is early determined in compilation time. No additional overhead in runtime execution. I still use the example to illustrate the drawback of static proxy. Suppose now the missing documentation issue also persists in QA colleagues. If we would like to still fix the issue via static proxy, it is inevitable that another proxy class for Tester has to be introduced. 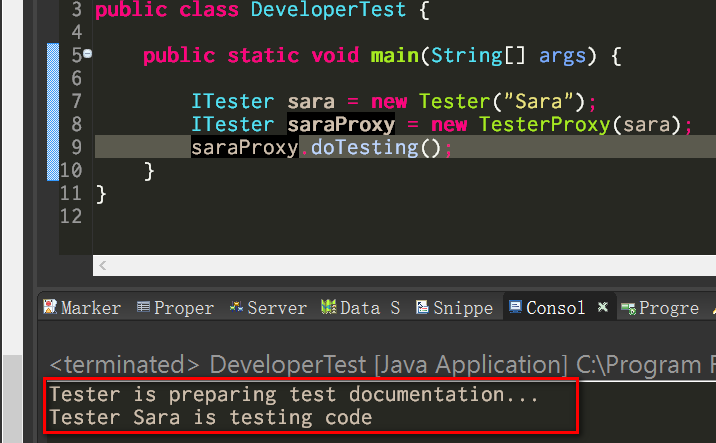 From the source code of Tester proxy it is easily observed that it has exactly the same logic as Developer proxy. If some time later we have to build the documentation gap for other roles in software delivery process, we have to introduce new static proxy class again and again, which leads to the inflation of static proxy class number and a violation of DRY – Don’t Repeat Yourself. Instead of having dedicated static proxy class for each original implementation class, now I use a common proxy class EnginnerProxy to serve all concrete roles. 1. Instead of inheriting from dedicated interface with business interface ( IDeveloper or ITester ), in this variant the generic proxy inherites from a technical interface InvocationHandler provided by JDK. 2. In order to ensure the generic proxy can work for all possible concrete implementation classes, a variable with generic type Object is defined within the proxy. 3. When the interface method of a proxyed instance is called, it is intercepted by invoke method defined in InvocationHandler, where the enhanced logic declared by application developer is called together with the original logic called by Java Reflection. Although this variant successfully avoids the duplication disadvantage in static proxy, it still has limitation that it fails to work with implementation class which is not inherited from an interface. CGLIB is a Byte Code Generation Library which provides high level API to generate and transform Java byte code. It is used by AOP, testing, data access frameworks to generate dynamic proxy objects and intercept field access.Check its detail documentation and sample code from github. Now I will create proxy class for ProductOwner class which does not implement any interface using CGLIB. From test result we can see clearly that even the implementation class ProductOwner does not implement any interface, still its public method defineBackLog is successfully proxyed. The magic of CGLIB has already been explained in my blog Simulate Mockito in ABAP. The dynamic proxy created by CGLIB is actually a transient subclass of original class being proxyed. This dynamic creation feature is so powerful that are widely used in many Java Framework such as Mockito to mock test object and AOP in Spring. On the other hand the limitation of this variant is also apparent due to its implementation approach based on inheritance. I just now mark ProductOwner class as final, after this change CGLIB proxy approach does not work any more: it only works for a class which is not marked as final. The left class ProductOwner below is a final class which DOES NOT implement any interface. Suppose I would like to create a new proxy class on top of it which prints out a documentation preparation log before the real operation of backlog definition is executed. As described in previous two variants, this requirement could not be fulfilled by either variant 1 or 2. As the last solution, I have to create a completely new class dynamically. Suppose I can get the source code of original class ProductOwner via file API in JDK, here for simplification reason I hard code the source code in method getSourceCode. Pay attention to line 35 highlighted: where the proxy logic to print documentation work is written. Consumer code and test output: it works as expected. The whole magic is in method getProxyClass(). 1. fill the source code for new Java class assembled from method getSourceCode into a new local file named ProductOwnerSCProxy.java ( SCProxy means SourceCode Proxy ). For simplification reason again I use the absolute file path. 3. Load the compiled class via ClassLoader. Once done, the class object is ready to be used in various reflection API. This variant is the least recommended solution as it will cause great security and performance trouble. So far the static proxy and three kinds of dynamic proxy pattern implementation in Java are introduced. All the related source code of examples used in this blog could be found from here. Static proxy pattern is also extensively used in variant CRM application or test framework. One example could be found from my blog An example to use CRM Mock framework for unit test. 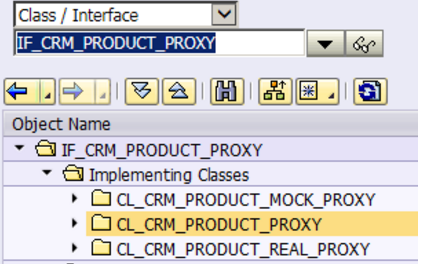 As the names of implementation classes give a very clear hint, CL_CRM_PRODUCT_MOCK_PROXY contains the mock logic while CL_CRM_PRODUCT_REAL_PROXY is responsible for the real productive logic. The proxy class created via this variant is transient, which means the class is only available in the current runtime session. It behaves something similar as the CGLIB variant introduced in Java part. 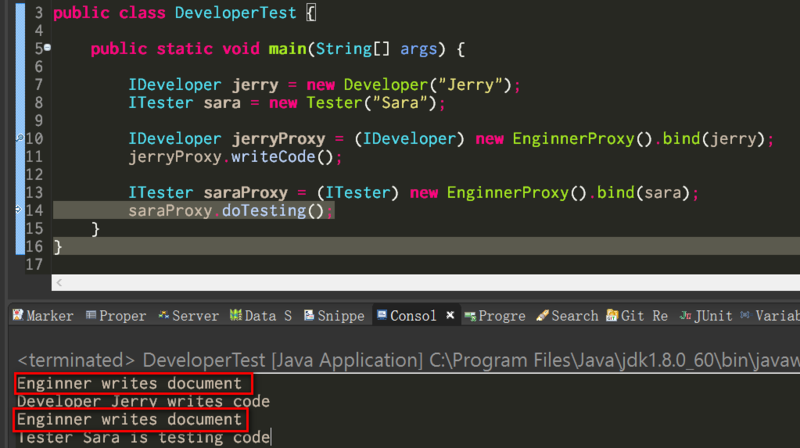 In previous chapter Dynamic proxy in Java – Variant3: Create Proxy class dynamically via compiler API, we see the possibility to create complete new class in Java via API. In ABAP again we have similar utility API for example function module SEO_CLASS_CREATE_COMPLETE could be used to create class with persistence based on source code specified by application developer. A detail description about how to achieve this variant could be found from blog Create dynamic proxy persistently in Java and ABAP. See a real use case Use Proxy pattern to make better image loading behavior in UI5. Now Jerry would like to learn some new languages in his spare time and of course Jerry still need to keep himself hired, which means both of the two function Employee.prototype.work and hireEmployee should keep unchanged. Now it is time for Proxy to go on the stage. First define a custom logic. An ABAPer can regard the below code a kind of post-exit defined in a class method. 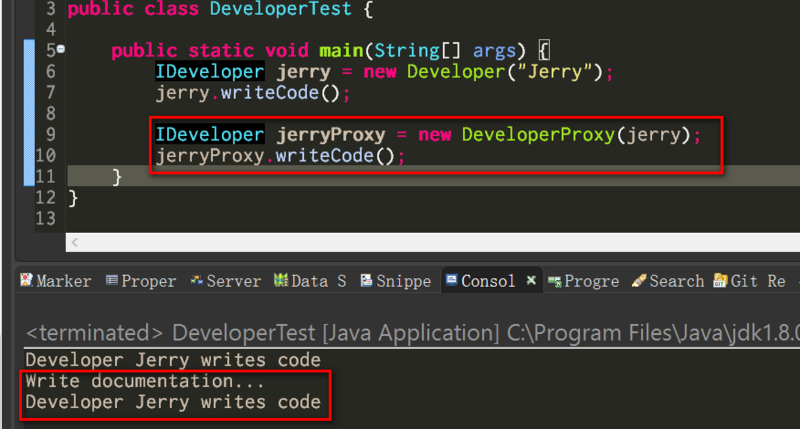 And create a new proxy which wraps the original employee instance for Jerry as the first argument of Proxy constructor, the second parameter is the customized behavior defined in variable proxyLogic.